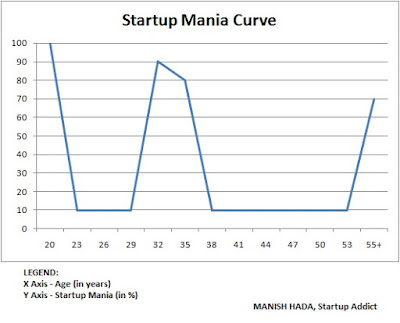 Startup Mania can be defined as the enthusiasm of a person to startup. Based on a lot of cases I have seen, this mania tends to follow a pattern with the age of a person. This may not be accurate in your case or cases you may have seen, but is the general trend I have seen in people around me. In college, everyone now is talking startups. “Startup is the new guitar. Every college kid wants one” - Arunabh Kumar. A person who is 20 and in college tends to develop a very strong startup mania and is highly inclined to startup or join a startup. Once this stage passes and you get into a mainstream job, the mania tends to go down. You start working and get ‘settled’ in your job. Things look good as you are learning a lot and doing new stuff. After 3-4 years, you start getting rewarded for the efforts put in and things keep moving in your career. Around 10 years in to the job, a stage comes when you feel you are not happy. You have a family, you are earning well, so why this feeling? You start thinking and realize maybe you are not enjoying your work anymore. You have heard people talking about how exciting startup life is. An urge again comes to startup and your mania levels rocket upwards. If this phases passes again and you end up either staying in your company or end up merely changing a job, you tend to get ‘settled’ again. This time, you do so for a long period. Now you decide to forget about startups and really start focusing on your job and career growth. You start looking at the highest position you can reach in your job and start putting in efforts for attaining it. 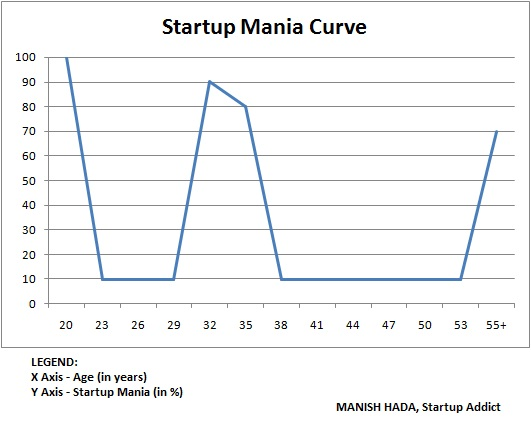 This is usually the longest phase and your startup mania remains low in it. You know you have to retire at some age (generally around 60). 5-7 years before it, you start planning your retirement. You are old but you still want to work. After all, how much can you travel or meditate or relax? You start planning a business which you can start and which can be with you even after you retire. The mania rises again. After this stage, the mania is irrelevant and you end up doing what you want to do combined with what is available to you.